Download "Package NHEMOtree. 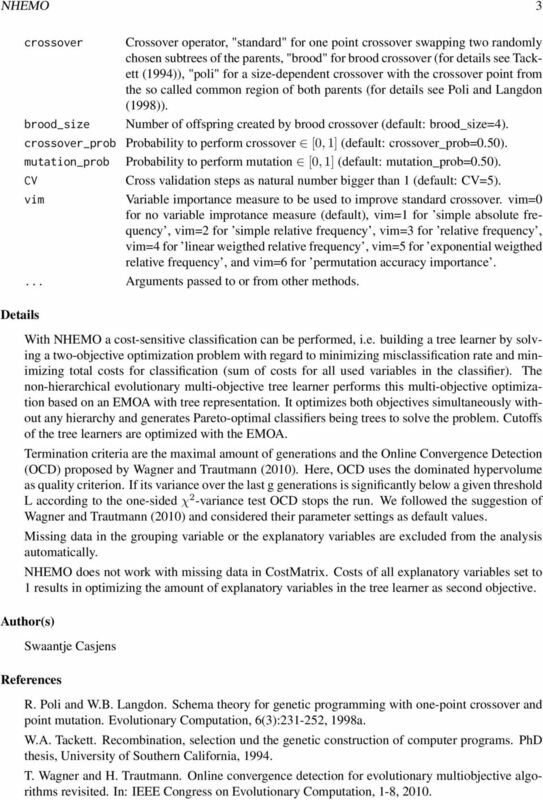 February 19, 2015"
2 2 NHEMO NHEMO Non-hierarchical evolutionary multi-objective tree learner to perform cost-sensitive classification Description NHEMO performs cost-sensitive classification by solving the non-hierarchical evolutionary twoobjective optimization problem of minimizing misclassification rate and minimizing total costs for classification. 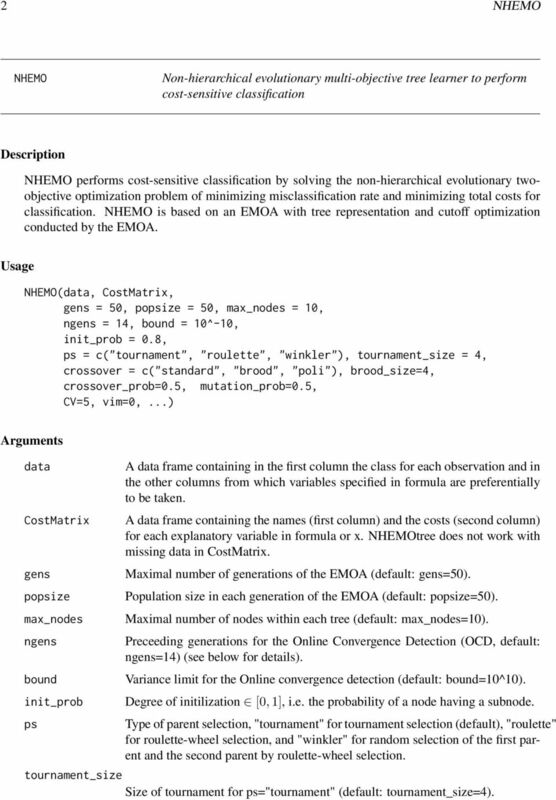 NHEMO is based on an EMOA with tree representation and cutoff optimization conducted by the EMOA. Usage NHEMO(data, CostMatrix, gens = 50, popsize = 50, max_nodes = 10, ngens = 14, bound = 10^-10, init_prob = 0.8, ps = c("tournament", "roulette", "winkler"), tournament_size = 4, crossover = c("standard", "brood", "poli"), brood_size=4, crossover_prob=0.5, mutation_prob=0.5, CV=5, vim=0,...) Arguments data CostMatrix gens popsize max_nodes ngens bound init_prob ps A data frame containing in the first column the class for each observation and in the other columns from which variables specified in formula are preferentially to be taken. A data frame containing the names (first column) and the costs (second column) for each explanatory variable in formula or x. NHEMOtree does not work with missing data in CostMatrix. Maximal number of generations of the EMOA (default: gens=50). Population size in each generation of the EMOA (default: popsize=50). Maximal number of nodes within each tree (default: max_nodes=10). Preceeding generations for the Online Convergence Detection (OCD, default: ngens=14) (see below for details). Variance limit for the Online convergence detection (default: bound=10^10). Degree of initilization [0, 1], i.e. the probability of a node having a subnode. Type of parent selection, "tournament" for tournament selection (default), "roulette" for roulette-wheel selection, and "winkler" for random selection of the first parent and the second parent by roulette-wheel selection. tournament_size Size of tournament for ps="tournament" (default: tournament_size=4). 3 NHEMO 3 crossover Crossover operator, "standard" for one point crossover swapping two randomly chosen subtrees of the parents, "brood" for brood crossover (for details see Tackett (1994)), "poli" for a size-dependent crossover with the crossover point from the so called common region of both parents (for details see Poli and Langdon (1998)). brood_size Number of offspring created by brood crossover (default: brood_size=4). crossover_prob Probability to perform crossover [0, 1] (default: crossover_prob=0.50). mutation_prob Probability to perform mutation [0, 1] (default: mutation_prob=0.50). CV Cross validation steps as natural number bigger than 1 (default: CV=5). vim Variable importance measure to be used to improve standard crossover. vim=0 for no variable improtance measure (default), vim=1 for simple absolute frequency, vim=2 for simple relative frequency, vim=3 for relative frequency, vim=4 for linear weigthed relative frequency, vim=5 for exponential weigthed relative frequency, and vim=6 for permutation accuracy importance.... Arguments passed to or from other methods. Details With NHEMO a cost-sensitive classification can be performed, i.e. building a tree learner by solving a two-objective optimization problem with regard to minimizing misclassification rate and minimizing total costs for classification (sum of costs for all used variables in the classifier). The non-hierarchical evolutionary multi-objective tree learner performs this multi-objective optimization based on an EMOA with tree representation. It optimizes both objectives simultaneously without any hierarchy and generates Pareto-optimal classifiers being trees to solve the problem. Cutoffs of the tree learners are optimized with the EMOA. Termination criteria are the maximal amount of generations and the Online Convergence Detection (OCD) proposed by Wagner and Trautmann (2010). Here, OCD uses the dominated hypervolume as quality criterion. If its variance over the last g generations is significantly below a given threshold L according to the one-sided χ 2 -variance test OCD stops the run. We followed the suggestion of Wagner and Trautmann (2010) and considered their parameter settings as default values. Missing data in the grouping variable or the explanatory variables are excluded from the analysis automatically. NHEMO does not work with missing data in CostMatrix. Costs of all explanatory variables set to 1 results in optimizing the amount of explanatory variables in the tree learner as second objective. Author(s) Swaantje Casjens References R. Poli and W.B. Langdon. Schema theory for genetic programming with one-point crossover and point mutation. 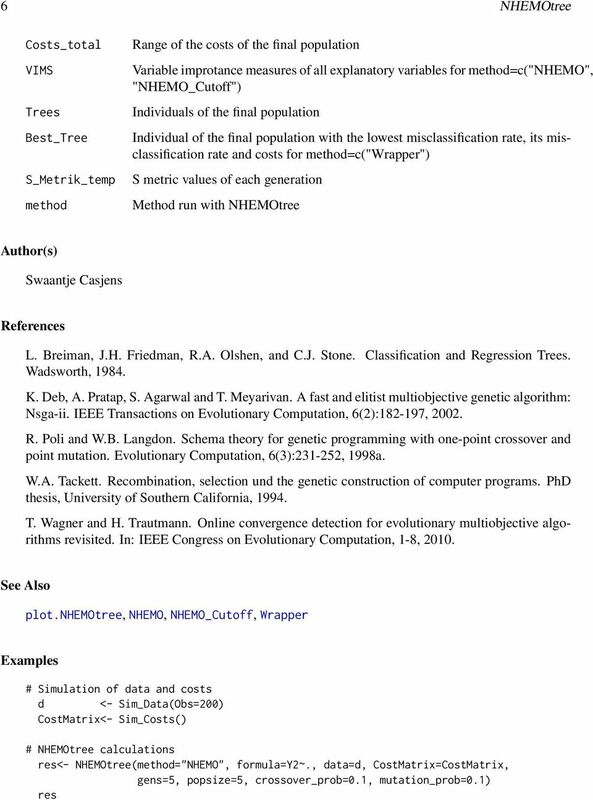 Evolutionary Computation, 6(3): , 1998a. W.A. Tackett. Recombination, selection und the genetic construction of computer programs. PhD thesis, University of Southern California, T. Wagner and H. Trautmann. Online convergence detection for evolutionary multiobjective algorithms revisited. In: IEEE Congress on Evolutionary Computation, 1-8, 2010. 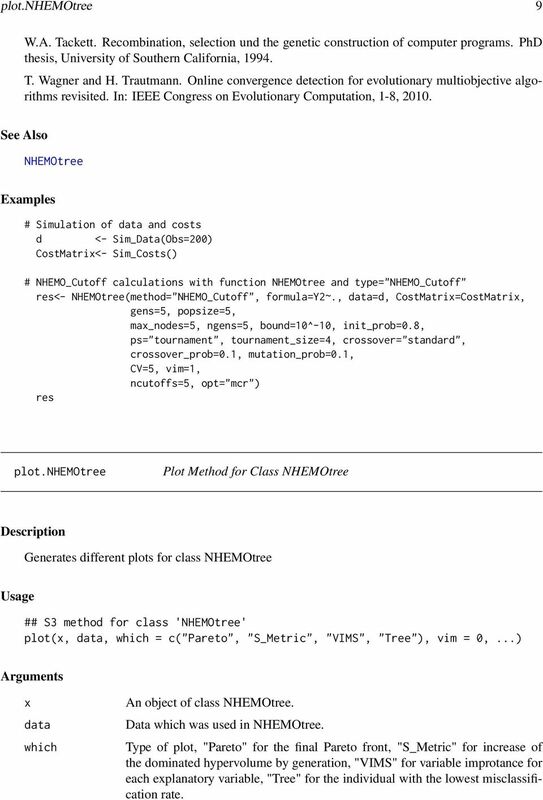 4 4 NHEMOtree See Also NHEMOtree Examples # Simulation of data and costs d <- Sim_Data(Obs=200) CostMatrix<- Sim_Costs() # NHEMO calculations with function NHEMOtree and type="nhemo" res<- NHEMOtree(method="NHEMO", formula=y2~., data=d, CostMatrix=CostMatrix, gens=5, popsize=10, max_nodes=5, ngens=5, bound=10^-10, init_prob=0.8, ps="tournament", tournament_size=4, crossover="standard", crossover_prob=0.1, mutation_prob=0.1, CV=5, vim=1) res NHEMOtree Non-hierarchical evolutionary multi-objective tree learner to perform cost-sensitive classification Description NHEMOtree performs cost-sensitive classification by solving the two-objective optimization problem of minimizing misclassification rate and minimizing total costs for classification. 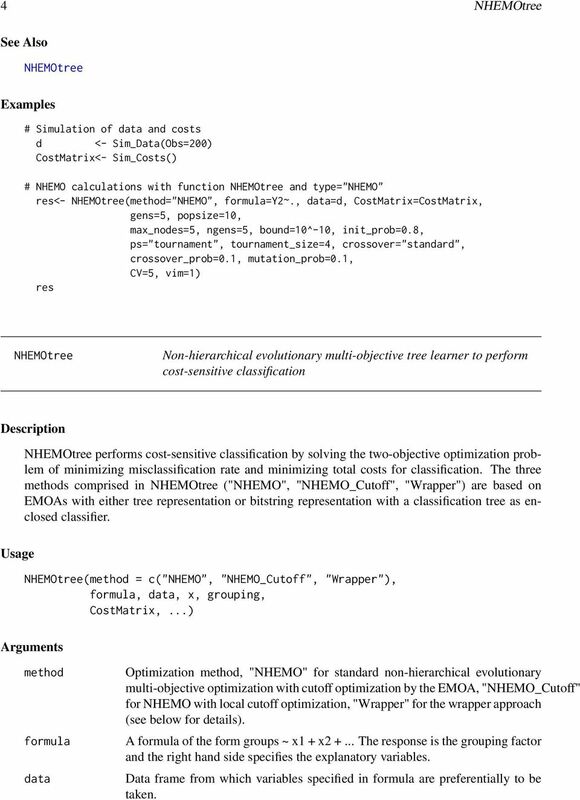 The three methods comprised in NHEMOtree ("NHEMO", "NHEMO_Cutoff", "Wrapper") are based on EMOAs with either tree representation or bitstring representation with a classification tree as enclosed classifier. 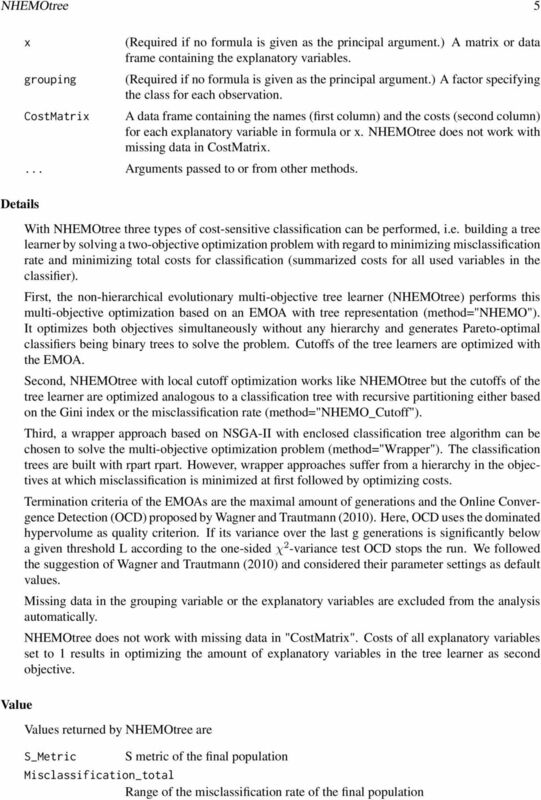 Usage NHEMOtree(method = c("nhemo", "NHEMO_Cutoff", "Wrapper"), formula, data, x, grouping, CostMatrix,...) Arguments method formula data Optimization method, "NHEMO" for standard non-hierarchical evolutionary multi-objective optimization with cutoff optimization by the EMOA, "NHEMO_Cutoff" for NHEMO with local cutoff optimization, "Wrapper" for the wrapper approach (see below for details). A formula of the form groups ~ x1 + x The response is the grouping factor and the right hand side specifies the explanatory variables. Data frame from which variables specified in formula are preferentially to be taken. 7 NHEMO_Cutoff 7 NHEMO_Cutoff Non-hierarchical evolutionary multi-objective optimization with local cutoff optimization Description Usage NHEMO_Cutoff performs cost-sensitive classification by solving the non-hierarchical evolutionary two-objective optimization problem of minimizing misclassification rate and minimizing total costs for classification. NHEMO_Cutoff is based on an EMOA with tree representation and local cutoff optimization. Cutoffs of the tree learner are optimized analogous to a classification tree with recursive partitioning either based on the Gini index or the misclassification rate. NHEMO_Cutoff(data, CostMatrix, gens = 50, popsize = 50, max_nodes = 10, ngens = 14, bound = 10^-10, init_prob = 0.8, ps = c("tournament", "roulette", "winkler"), tournament_size = 4, crossover = c("standard", "brood", "poli"), brood_size = 4, crossover_prob = 0.5, mutation_prob = 0.5, CV = 5, vim = 0, ncutoffs = 10, opt = c("gini", "mcr")) Arguments data CostMatrix gens popsize max_nodes ngens bound init_prob A data frame containing in the first column the class for each observation and in the other columns from which variables specified in formula are preferentially to be taken. A data frame containing the names (first column) and the costs (second column) for each explanatory variable in formula or x. NHEMOtree does not work with missing data in CostMatrix. Maximal number of generations of the EMOA (default: gens=50). Population size in each generation of the EMOA (default: popsize=50). Maximal number of nodes within each tree (default: max_nodes=10). Preceeding generations for the Online Convergence Detection (OCD, default: ngens=14) (see below for details). Variance limit for the Online convergence detection (default: bound=10^10). Degree of initilization [0, 1], i.e. the probability of a node having a subnode (default: init_prob=0.80). ps Type of parent selection, "tournament" for tournament selection (default), "roulette" for roulette-wheel selection, and "winkler" for random selection of the first parent and the second parent by roulette-wheel selection. tournament_size Size of tournament for ps="tournament" (default: tournament_size=4). 8 8 NHEMO_Cutoff crossover brood_size Crossover operator, "standard" for one point crossover swapping two randomly chosen subtrees of the parents, "brood" for brood crossover (for details see Tackett (1994)), "poli" for a size-dependent crossover with the crossover point from the so called common region of both parents (for details see Poli and Langdon (1998)). Number of offspring created by brood crossover (default: brood_size=4). crossover_prob Probability to perform crossover [0, 1] (default: crossover_prob=0.50). mutation_prob CV vim ncutoffs opt Details Probability to perform mutation [0, 1] (default: mutation_prob=0.50). Cross validation steps as natural number bigger than 1 (default: CV=5). Variable importance measure to be used to improve standard crossover. vim=0 for no variable improtance measure (default), vim=1 for simple absolute frequency, vim=2 for simple relative frequency, vim=3 for relative frequency, vim=4 for linear weigthed relative frequency, vim=5 for exponential weigthed relative frequency, and vim=6 for permutation accuracy importance. Number of cutoffs per explanatory variable to be tested for optimality (default: ncutoffs=10). Type of local cutoff optimization, "gini" for local cutoff optimization by Gini index (default), "mcr" for local cutoff optimization by misclassification rate. 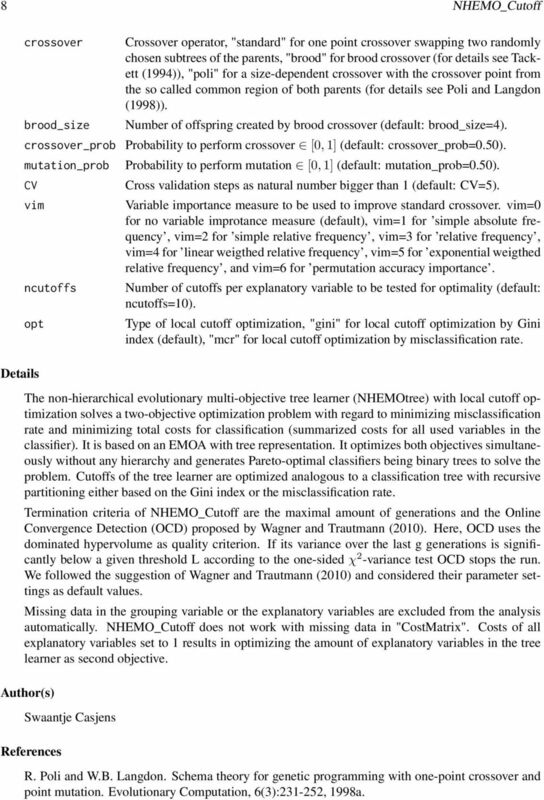 The non-hierarchical evolutionary multi-objective tree learner (NHEMOtree) with local cutoff optimization solves a two-objective optimization problem with regard to minimizing misclassification rate and minimizing total costs for classification (summarized costs for all used variables in the classifier). It is based on an EMOA with tree representation. It optimizes both objectives simultaneously without any hierarchy and generates Pareto-optimal classifiers being binary trees to solve the problem. Cutoffs of the tree learner are optimized analogous to a classification tree with recursive partitioning either based on the Gini index or the misclassification rate. Termination criteria of NHEMO_Cutoff are the maximal amount of generations and the Online Convergence Detection (OCD) proposed by Wagner and Trautmann (2010). Here, OCD uses the dominated hypervolume as quality criterion. If its variance over the last g generations is significantly below a given threshold L according to the one-sided χ 2 -variance test OCD stops the run. We followed the suggestion of Wagner and Trautmann (2010) and considered their parameter settings as default values. Missing data in the grouping variable or the explanatory variables are excluded from the analysis automatically. NHEMO_Cutoff does not work with missing data in "CostMatrix". Costs of all explanatory variables set to 1 results in optimizing the amount of explanatory variables in the tree learner as second objective. Author(s) Swaantje Casjens References R. Poli and W.B. Langdon. Schema theory for genetic programming with one-point crossover and point mutation. Evolutionary Computation, 6(3): , 1998a. 9 plot.nhemotree 9 W.A. Tackett. Recombination, selection und the genetic construction of computer programs. PhD thesis, University of Southern California, T. Wagner and H. Trautmann. Online convergence detection for evolutionary multiobjective algorithms revisited. 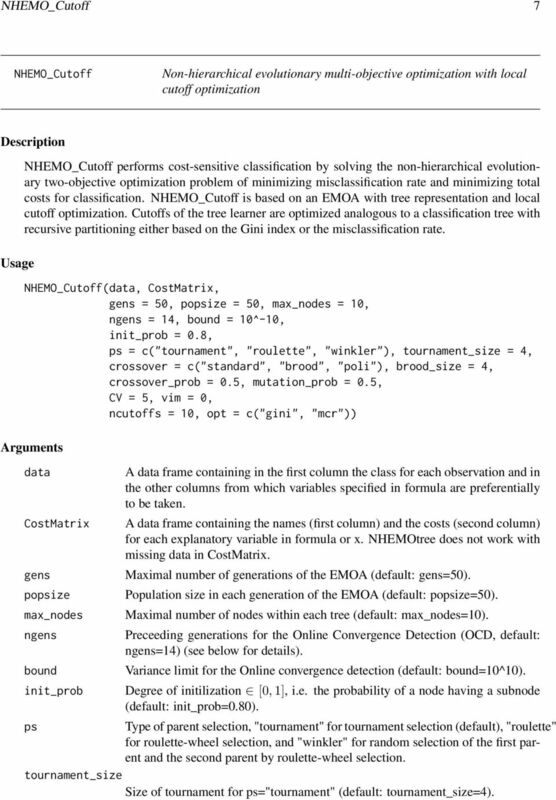 In: IEEE Congress on Evolutionary Computation, 1-8, See Also NHEMOtree Examples # Simulation of data and costs d <- Sim_Data(Obs=200) CostMatrix<- Sim_Costs() # NHEMO_Cutoff calculations with function NHEMOtree and type="nhemo_cutoff" res<- NHEMOtree(method="NHEMO_Cutoff", formula=y2~., data=d, CostMatrix=CostMatrix, gens=5, popsize=5, max_nodes=5, ngens=5, bound=10^-10, init_prob=0.8, ps="tournament", tournament_size=4, crossover="standard", crossover_prob=0.1, mutation_prob=0.1, CV=5, vim=1, ncutoffs=5, opt="mcr") res plot.nhemotree Plot Method for Class NHEMOtree Description Generates different plots for class NHEMOtree Usage ## S3 method for class NHEMOtree plot(x, data, which = c("pareto", "S_Metric", "VIMS", "Tree"), vim = 0,...) Arguments x data which An object of class NHEMOtree. Data which was used in NHEMOtree. Type of plot, "Pareto" for the final Pareto front, "S_Metric" for increase of the dominated hypervolume by generation, "VIMS" for variable improtance for each explanatory variable, "Tree" for the individual with the lowest misclassification rate. 12 12 Wrapper discriminate class 3 worse than X3. X7 to X10 are noisy variables drawn from a normal distribution that contain no information. Noise is added to the class assignment by a binomial distribution. Each potential class is only with probability "VG" the equivalent class and with probability 1-"VG" one of the other classes. Variable costs correlate with their prediction accuracy so that variables containing more information are more expensive than variables with less or none information. 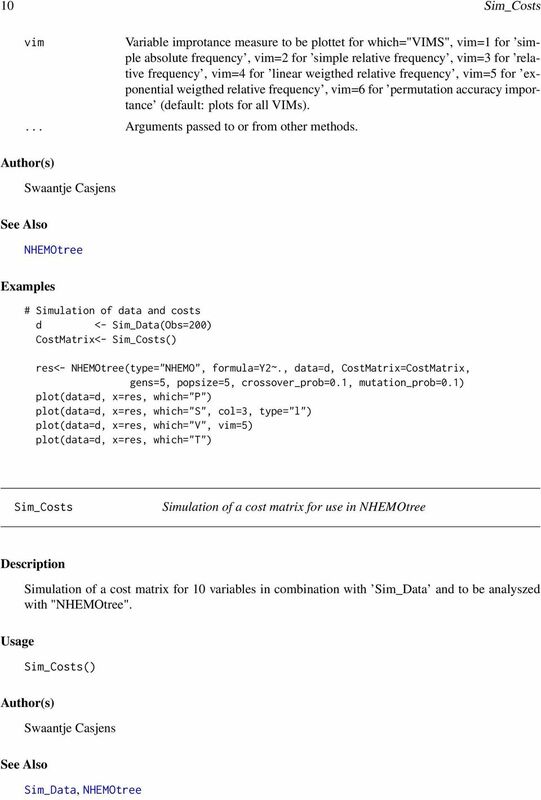 The costs of the variables are generated with function "Sim_Costs". Author(s) See Also Swaantje Casjens Sim_Costs, NHEMOtree Examples d<- Sim_Data(Obs=200) head(d) Wrapper NSGA-II wrapper with enclosed classification tree algorithm Description Usage This wrapper approach is based on the Nondominated Sorting Genetic Algorithm II (NSGA-II) with an enclosed classification tree algorithm. It performs cost-sensitive classification by solving the two-objective optimization problem of minimizing misclassification rate and minimizing total costs for classification. 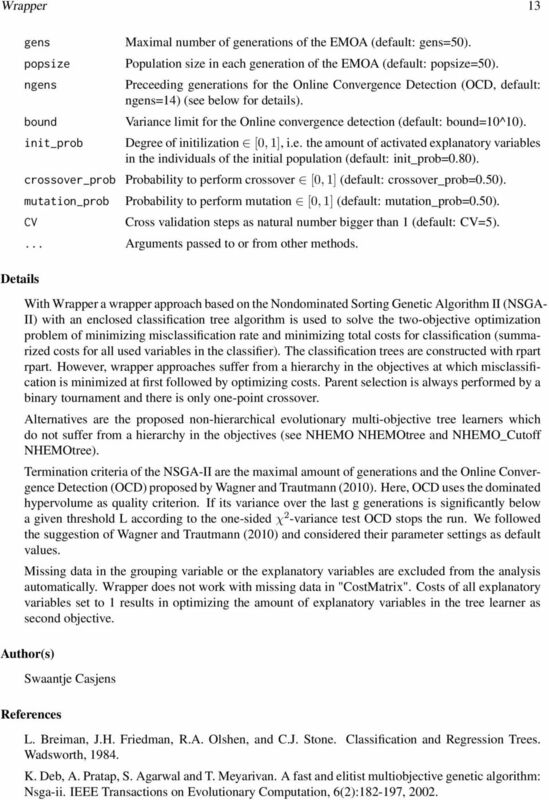 Wrapper(data, CostMatrix, gens = 50, popsize = 50, ngens = 14, bound = 10^-10, init_prob = 0.8, crossover_prob = 0.5, mutation_prob = 0.5, CV = 5,...) Arguments data CostMatrix A data frame containing in the first column the class for each observation and in the other columns from which variables specified in formula are preferentially to be taken. A data frame containing the names (first column) and the costs (second column) for each explanatory variable in formula or x. NHEMOtree does not work with missing data in CostMatrix. 13 Wrapper 13 gens popsize ngens bound init_prob Maximal number of generations of the EMOA (default: gens=50). Population size in each generation of the EMOA (default: popsize=50). Preceeding generations for the Online Convergence Detection (OCD, default: ngens=14) (see below for details). Variance limit for the Online convergence detection (default: bound=10^10). Degree of initilization [0, 1], i.e. the amount of activated explanatory variables in the individuals of the initial population (default: init_prob=0.80). crossover_prob Probability to perform crossover [0, 1] (default: crossover_prob=0.50). mutation_prob CV Details Probability to perform mutation [0, 1] (default: mutation_prob=0.50). Cross validation steps as natural number bigger than 1 (default: CV=5).... Arguments passed to or from other methods. 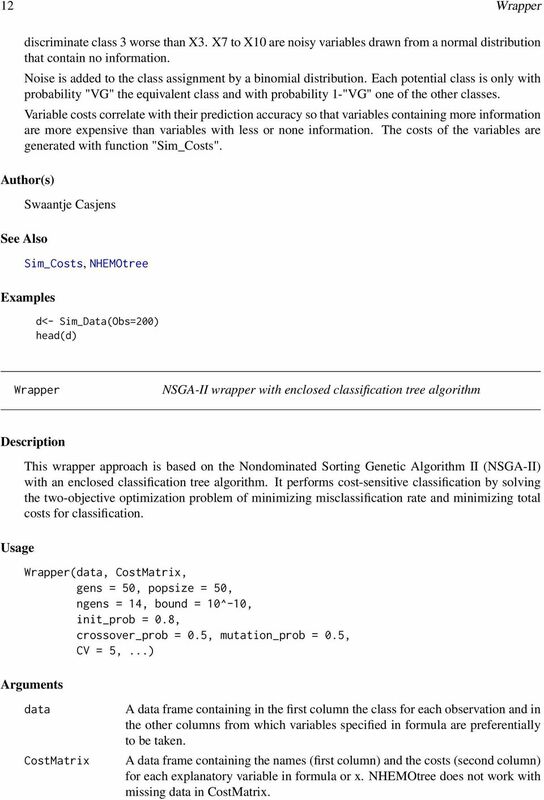 With Wrapper a wrapper approach based on the Nondominated Sorting Genetic Algorithm II (NSGA- II) with an enclosed classification tree algorithm is used to solve the two-objective optimization problem of minimizing misclassification rate and minimizing total costs for classification (summarized costs for all used variables in the classifier). The classification trees are constructed with rpart rpart. However, wrapper approaches suffer from a hierarchy in the objectives at which misclassification is minimized at first followed by optimizing costs. Parent selection is always performed by a binary tournament and there is only one-point crossover. 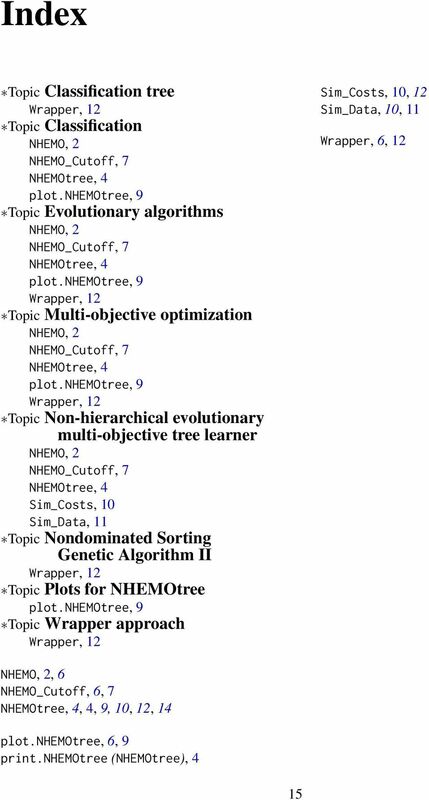 Alternatives are the proposed non-hierarchical evolutionary multi-objective tree learners which do not suffer from a hierarchy in the objectives (see NHEMO NHEMOtree and NHEMO_Cutoff NHEMOtree). Termination criteria of the NSGA-II are the maximal amount of generations and the Online Convergence Detection (OCD) proposed by Wagner and Trautmann (2010). Here, OCD uses the dominated hypervolume as quality criterion. If its variance over the last g generations is significantly below a given threshold L according to the one-sided χ 2 -variance test OCD stops the run. We followed the suggestion of Wagner and Trautmann (2010) and considered their parameter settings as default values. Missing data in the grouping variable or the explanatory variables are excluded from the analysis automatically. Wrapper does not work with missing data in "CostMatrix". Costs of all explanatory variables set to 1 results in optimizing the amount of explanatory variables in the tree learner as second objective. Author(s) Swaantje Casjens References L. Breiman, J.H. Friedman, R.A. Olshen, and C.J. Stone. Classification and Regression Trees. Wadsworth, K. Deb, A. Pratap, S. Agarwal and T. Meyarivan. A fast and elitist multiobjective genetic algorithm: Nsga-ii. 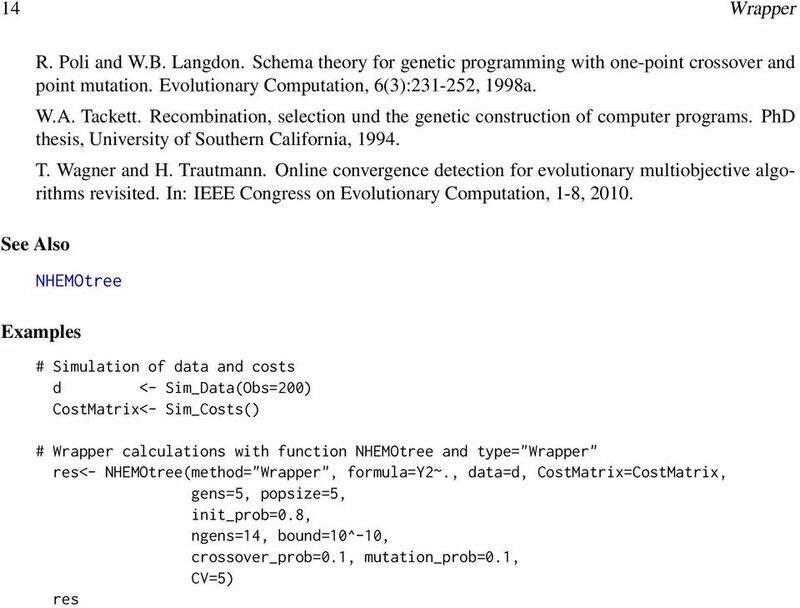 IEEE Transactions on Evolutionary Computation, 6(2): , 2002. Index Terms- Batch Scheduling, Evolutionary Algorithms, Multiobjective Optimization, NSGA-II. Chapter 5 Clustering & Visualization Clustering in high-dimensional databases is an important problem and there are a number of different clustering paradigms which are applicable to high-dimensional data. Keywords: Beta distribution, Genetic algorithm, Normal distribution, Uniform distribution, Yield management.